We Manufacture this COPPER PENDANT SET on make to order basis choice of metal polish & colour of stones available. There is always something exciting to look forward to with our Fancy Pendant Set offered our clients with our great delivery system, with highly responsive and we utilize triple security on every item sent. 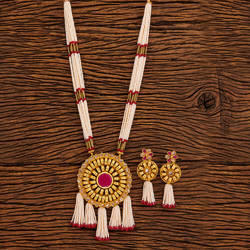 Peacock Style polki and kundan pendant set with single lineof gold balls , designed by our inhouse designing team we provide latest designs in high end fashion jewellery , we are manufacturers , wholesalers and exporters of designer indian ethic jewellery. Imported Fashion Jewellery for Ladies and young girls. Best quality and inexpensive imitation jewellery. Pure Metal. Distributed all over India.